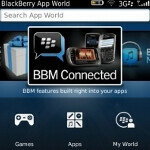 Last month, we told you that RIM would be shortly updating BlackBerry App World with version 3.1. The Canadian manufacturer is now passing along the word that the update has been launched and BlackBerry users will receive notification of the update in the next few days. If you can't wait, click on the sourcelink to download the update now. One of the more interesting new features allows you to request the gift of an app from another BlackBerry user. Of course, it is better to give than receive so the feaqture also allows you to make a gift to someone in the form of an app. And if its kosher with your wireless carrier, you can pay for the gift directly through your monthly wireless bill in addition to using PayPal or a credit card. Another addition is a ratings system that allows you to prevent your kids from installing certain apps that you deem too risque for them. The rating system is based on the CTIA's "Guidelines for App content classification and rating". 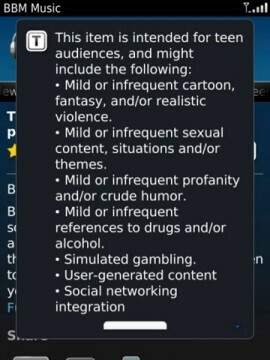 The default rating is "Adult" which allows all apps to be purchased. Once the new AppWorld storefront has been launched, BlackBerry users will be able to change the rating by going to My Account > Content Controls" as seen below. The different rating classifications are Adult, Mature, Teen or General. One last change to BlackBerry App World is that the storefront will now be accessible via Wi-Fi. You will now be able to browse apps, purchase and install a new app even when you do not have a cellular signal. I just wonder what this all means in real world terms and what real advantages it offers the average punter. Is it just a cool tool for techno geeks? Sometimes too much choice e is like too much of a good thing. Any news a out the software update for Playbook due Feb 2012? I have this update on my BlackBerry Pearl 3G 9105, however, I am having problems as it tends to freeze amost all the time even when I am writing a text or accessing the apps! So I am going to do a factory restore it and see if that helps.